Alan Devonshire (born 13/4/1956, London) is a retired English footballer who made his name in the late 1970s playing for West Ham as a midfielder from 1976 until 1990. In his 14 year career at the Hammers he scored 29 goals in 345 appearances, and was part of the famous team that included Trevor Brooking. While at West Ham, Devonshire won the 1980 FA Cup Final against Arsenal. He was also capped for England 8 times during his international career. In 1990 he signed to Watford where he remained for two years before becoming manager at Maidenhead United where he was very successful. 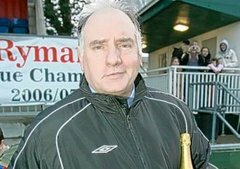 Since 2003 Devonshire has been the manager of Hampton & Richmond Borough in the Conference South where he has been highly successful in restoring the club.